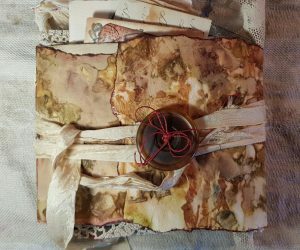 This is an altered book, junk journal created from an old book about reading topographical maps. Throughout I have removed pages, rough torn other pages to create stubs and pockets, and added envelopes, tabs, and cards. I have also added handwritten prompts throughout and lots of tea-dyed graph paper and vintage ledger pages for reflection. Take a prompt and write through, add some drawing and collage of your own and you will find yourself closer to your creative goals for the year to come! Click on a gallery thumbnail for a clearer view. 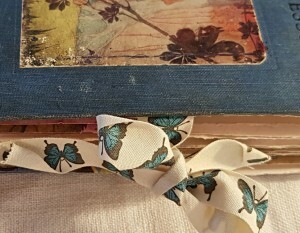 This is a handbound, one-of-a-kind blank book that can be used as a journal, scrapbook, or sketchbook or what you will. 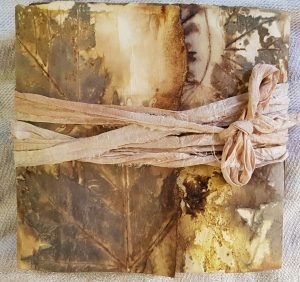 That wraparound cover is made from heavy, watercolour paper that has been eco printed with leaves collected on my hikes in the Blue Ridge Mountains last month. (You can find a free tutorial on how to make these leaf, eco prints under Workshops.) The pages are Daler Rowney fine grain, 98 lb. (160 g/m) so it can stand up to paint and glued embellishments. 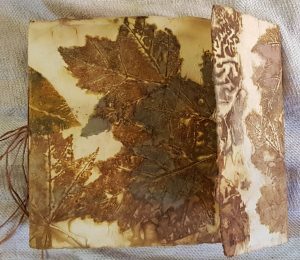 The pages are tea dayed or tea drizzled, and several have been embellished with mark-making with acorn and walnut inks that I also made. You can write or draw over these marks or incorporate them into an original design of your own. 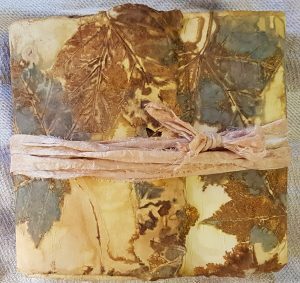 To finish, each book is tied with three yards of tea-dyed, sari silk. My first junk journal for the Design Team of The Graphics Fairy is kind of wild and free-form. 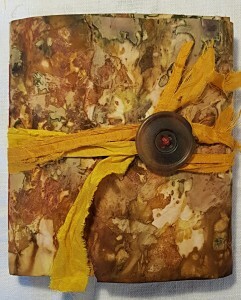 The cover is made from plant-dyed paper using purple and yellow onion skins and it closes with a vintage, celluloid button and tea-dyed sari silk. While there are so many great images available on The Graphics Fairy for free, I really went to town with some of the features on the Premium Membership Site where there are tons of pre-formed pockets, envelopes, cards, and the like. One of my favourite things is the printable washi tape. While you can print it on sticky paper directly, I really love the effect of printing it on tracing paper and using an adhesive to attach it to my pages, as I have done to make a border for the pocket, also made of tracing paper. 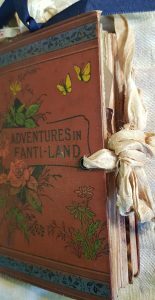 As it is translucent, you can see some of the detail of the pocket inside made from a Vintage Journaling Card and Pocket. 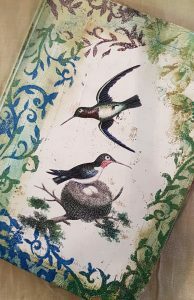 Inside of this is a French Journaling Card.